A great alternative for spinach dip. 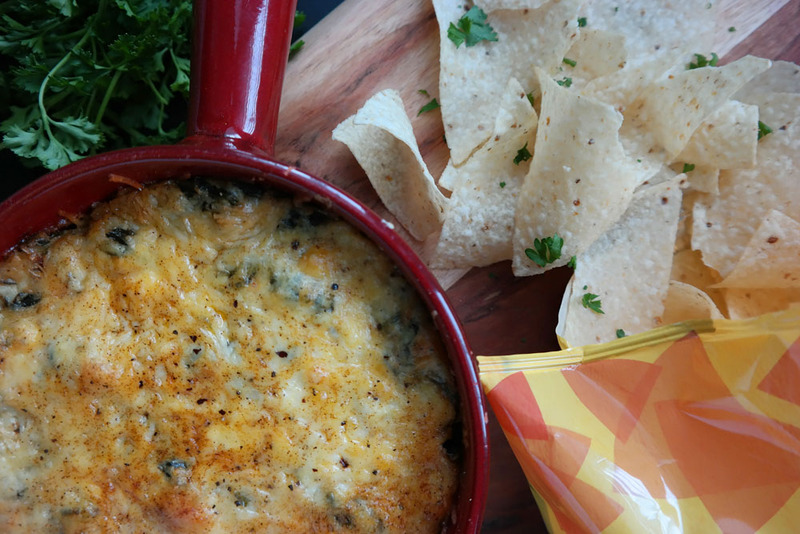 Impress your guests with this savory, soulful, and cheesy Collard Green Dip appetizer. 2. In a large sauté pan, warm oil over medium heat. Add collard greens, one bunch at a time, until withered – for approximately 5 minutes. Add crushed red pepper flakes, minced garlic, sugar, and salt. Sauté ingredients for an additional 5 minutes. 3. Add water to pan, cover, and reduce heat to low. Steam collard greens for approximately 10 – 15 minutes or until tender and all water is absorbed. Turn off the heat. 4. Mix in sour cream and cream cheese into the collard greens until melted. Mix in additional shredded cheeses (reserve some cheese for the top of the dip). 5. Pour collard green mixture into a small baking dish. Top with additional shredded cheese and paprika. 6. Bake collard green dip for 20 – 25 minutes or until the top is browned. 7. Serve with tortilla chips or a sliced toasted baguette.